While famous auto racer Emerson Fittipaldi is well known for his accomplishments on the race track, his role in building a wild Volkswagen for a Brazilian endurance race is an interesting albeit lesser known tale. Jalopnik Brazil editor Leo Nishihata explains. — Ed. In 1969 Emerson Fittipaldi was already racing in Europe, but he often returned to Brazil during the racing offseason, to avoid the cold northern hemisphere winter. His older brother, Wilson, stayed in Brazil managing the Fittipaldi team and other family businesses which included building tuning kits, racing steering wheels and Formula Vee cars. In November of that year, the Thousand Miles of Guanabara, an important endurance race was to be held. With just a few months before the race Fittipaldi still did not have a car strong enough to cope with the competition. That competition promised to be very strong, including nothing less than Ford GT40s, Lola T70s, Alfa Romeo T33s and a series of national prototypes that featured high horsepower, wings, streamlined designs and all of the characteristics you might expect from a race car, all of which couldn't be more different than a Volkswagen Beetle. 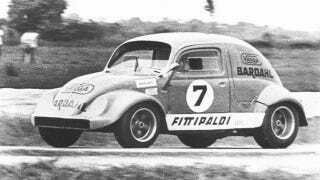 Unlike the exotic race cars, the Beetle and all of its parts were widely available in Brazilian market at the time, which led Fittipaldi and his team to decide on one as the basis of their race car for the Thousand Miles of Guanabara. The team was formed by the Fittipaldi brothers and included tuners Nelson Brizzi, Ari Leber and Richard Divilla (who later worked for Ligier and Nismo). The biggest and most obvious obstacle in using the Beetle as a racecar was figuring out a way to extract more power from the tiny 1300cc 46 hp boxer that was the standard Brazilian Beetle engine at the time. Brazilian tuning kits were available to bore the engine to 1600cc and with a new camshaft, manifolds and special carburetors, the power could be increased to a miraculous 130 hp. Even though this improvement in power was significant, it still wasn't enough to go head to head with the purpose built race cars. To solve this problem the team came up with a novel idea. Equipped with two small engines producing a combined 260 horsepower, a 1100 pound Volkswagen Beetle could match the power-to-weight ratio of the larger and more powerful cars. The team devised a plan to join the two boxer engines using an elastomeric gasket, with the crankshafts connected, resulting in a 3.2 liter mid-mounted flat-eight engine. The eight exhaust pipes were connected into a single output, right above the five-speed gearbox from a Porsche 550 Spyder, which would also donate the drum brakes, the steering column and front suspension to the double engine Beetle. As you might imagine, by the time the work was done there was very little left of the original Beetle. The car's back half was transformed into a tubular structure mounted on the remains of the original chassis. Only a firewall separated the driver from the deafening invention - can you imagine the roar of a tuned air-cooled VW engine multiplied by two? The rear suspension was a Formula Vee semi-swing axle with coil springs. Wilson Fittipaldi explained that the car had "a tremendous torque," and was built to go sideways through the corners, because "that was the only way to set a good lap time with that car." The most difficult part was building the Beetle was figuring how to keep the pieced together engine cool. Wilson and Divilla eventually created ducts along the car roof, which fed air captured above the raked windshield to four pipes connected to the engines. To cover all this kludge they built a very light and thin fiberglass body over a structure which protected the pilot of the suicide machine. According to car culture site Obvio!, Okrasa kits were eventually imported by the team and used to bore displacement to 2.2 liters each engine, or 4.4 liters in total. The resulting final version of the engine produced nearly 400 horsepower thanks to new cams, crankshaft and .45 Weber carburetors. While high power drag racing Beetles are very common in Brazil, they just need to go in straight lines. This Beetle needed to go fast while being able to capture GT40s and Lolas in the turns. In less than two months, the car was ready and tested at Interlagos. During the practice for the Thousand Kilometers of Guanabara, at the former Jacarepagua track (previous to the one used by Formula 1 in the 80s), Emerson Fittipaldi nailed the third fastest lap time. Fittipaldi and the double engine Beetle were behind only Carlos Pace in an Alfa Romeo T33 and the Ford GT40 driven by Sidney Cardoso, posting a better time than Pumas, Lorena-Porsche and a Lola T70. During the race, to everyone's amazement, the atomic Beetle that looked more like an racing helmet than a race car maintained the third place for the first hour. The Beetle raced until the gearbox (or the gasket, depending on the source) could not continue and the Fittipaldis and their team were forced to drop out of the race. This project may be the greatest talent concentration to ever focus a single VW Beetle and the result was as amazing as you could expect from such a team. Sadly, the car was sold and partly dismantled, and eventually disappeared into history. But what a story! This story originally appeared on Jalopnik.com.br on January 20, 2011, and was republished with permission.